Do you have a hard time finding knee/shin guards for your little motocross riders? Well Fox Racing has designed a smaller knee/shin guard that is specifically for younger aged children ages 3 to 9. The Fox Racing Pee Wee Knee/Shin Guards are designed with a tough plastic shell for protection and also have adjustable straps that are easy for the parents and child to adjust. The Fox Racing Pee Wee Knee/Shin Guards are made so your child can walk and bend their knee with out any problems. Make sure that you are keeping your child protected and safe with the Fox Racing Pee Wee Knee/Shin Guards. Smaller design specifically geared for children aged 3 through 9. Tough plastic shells for impact resistance. Easy to adjust strap system, for parents and the child. Soft backing material prevents chafing. Perforated Biofoam chassis for increased ventilation. Cant beat the value. They fit great and good protection. Perfect fit for my 60 pound 8 year old. Tried other youth knee pads, but they were too big and uncomfortable - thus he wouldn't wear them. These are just the right size. They aren't as sturdy as the more expensive, larger versions, but they are way better than none at all. Very good fitment for kids ???? These knee pads are for my 5 year old 40lbs rider and he loved wearing them at his frist race. Great product and good price easy for my daughter to put on and fit good. would recommend for new riders. anyone putting their kids into the sport, wouldn't recommend for faster kids. Bought for my 8 yr old. Great fit good protection unreal price! I bought these for my son an the love's them. 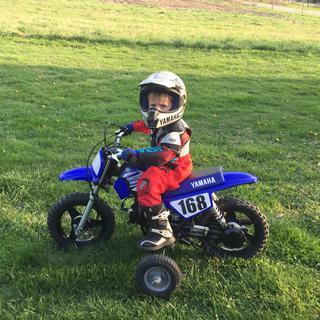 He won't ride his dirt bike without them. I would recommend wearing extra long sock with them, make them more comfortable. 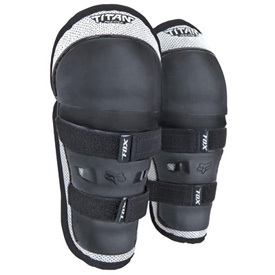 These are good pads and they protect well on falls due to the hard outer shell. These worked great for my little girl. She wore them from age 4 to 6 & she could put them on her self! My kids love them and so far no knee injuries. They are true to size you will not be let down. Machine washable and still durable as the first time they wore them. Great guards for youth riders just starting out. Have come in handy many many falls. I wrote a so-so review for the Fox pee wee elbow guards, but the knee guards are entirely different. I mean you can pick these up for $15-20?!? These are awesome for small kids, very solid, great fit. I mean my daughter complains about some tags on her shirt, and she has no complaints about these, and they've definitely helped on a few falls. My 8yr old uses these. A decent amount of protection without the bulk. My 4 and 6 year old use the same size, they don't complain about them and they make me feel a little better that they are wearing them! Fit is great and the price is reasonable, I doubt they could prevent much other than scrapes but there cheap enough and they seem comfortable for the kids why not wear them. Our boys love them! Won't ride without them. One is 6 years and the other is 8, fits them both great. Fox makes great gear. Have protected my girls' knees plenty of times. Both my eight year old daughter and my five year old son wear these. They have been great. They stay in place and offer good protection. My five year old has really put them to the test with regular tip overs. He frequently gets his leg stuck under the bike when he crashes but hasn't had any injury with these guards on. They have held up well and are still in great shape. Just the right fit for my 6 year old. Confidence builder and protection at the same time. Can't be beat for protection and price ! awesome fit , feel, protection. only complaint is the velcro straps are too short. could use one inch more adjustment. these gaurds are small and a perfect fit for my small 5 yr old. Fits my 5yr son great, he likes them.